Riding season is officially here, and triple digit temperatures are just around the corner. Even though blistering heat accompanies the summer months in many of the areas that we live, two and four-wheeled enthusiasts head out in hordes to take advantage of their chance to ride. So how do you stay cool on your ride and avoid overheating when the temperatures spike? Take a look at our guide for surviving the summer heat while you play out in the sun! First and foremost, drink up!! Before you even hit the road or the trail, you should be hydrating your body to prepare for your ride. The duration of time you plan to ride will determine the amount of time beforehand that you should start chugging some H20. Your top priority while riding in the heat will be keeping your body hydrated and your core temperature down, so the longer the amount of time you will ride, the longer before the ride you should start drinking up. Make sure you grab a drink each time you stop, at least one pint (one regular sized water bottle) per hour. It might sound like a lot, but trust us – between the water you are going to lose by sweating and the battle with the constant heat, you’re going to need it. Pack some frozen water bottles in your pack or saddlebags in addition to regular water bottles and not only will they keep the regular bottles cold, you’ll have cold drinks available as they melt along your ride. Hydration packs are also an easy way to stay hydrated as you can drink from them at any time along the ride. There are a ton of different types to choose from – you can get one to wear alone, one that is already incorporated into a pack and even some that are directly built in to your riding jacket. Adding some electrolyte-based (salt) drinks can be a good idea, especially if you have been sweating a lot. Carbonated drinks aren’t recommended but if it is all you have, it’s better than nothing. However, avoid caffeinated and alcoholic beverages – both alcohol and caffeine actually dehydrate your body even more. Stick with water or something like a sports drink if possible. Supplements might even be a good idea to help give you the extra nutrients you might need to replace as you battle both heat and fatigue on your ride. Your body uses water to keep itself cool by regulating body temperature and internal organ functions. If you don’t get enough fluids, it can cause a lot of problems, such as heavy sweating, muscle cramps, headaches, fatigue dizziness and more if left without taking care of it. If you do start feeling any of these symptoms, find some shade or a cool room to rest, rehydrate and cool off until you feel better. As counter-intuitive as it seems, covering up while you are out riding in the heat will actually help keep your body cooler because it keeps the direct sunlight off of your skin and allows your sweat to do its job. Riding without covering up your skin doesn’t just up your risk of a sunburn, exposing your skin to the wind as you ride causes your sweat to evaporate quicker than it would if you were wearing long sleeves or a riding jacket. Instead of letting your sweat expel heat from your body, the hot air will act like a giant blow dryer and prematurely cause your sweat to evaporate, which ends up raising your core temperature instead of lowering it. Hot weather gear is the easiest way to keep the sun off of your skin while providing optimal ventilation to help keep your body cool. There are tons of great jackets, pants and gloves designed for hot weather riding that offer pretty decent protection and ventilate the air around your body at the same time. Textile and mesh riding gear provides more ventilation than the vents in your leather gear typically does – however, nothing quite beats the abrasion resistance of good quality leather. Be sure to do your research to find gear that will offer both the best ventilation and protection for your ride. And remember, the lighter the color, the less sun it will absorb. Good gear can make a huge difference on a hot day. If any of your skin ends up exposed to the sun, make sure you use a high SPF sunscreen and reapply every hour or so out on the ride. It will at least help prevent painful sunburns and even higher body temperatures. Even good ventilation can still leave you feeling the heat when the day is hot enough. If your body temperature continues to elevate, it can be pretty dangerous. Sometimes you need to take it a step further to keep yourself cool when you ride in the heat. Base layers, cooling vests and neck coolers can be great way to help the cooling process of your body. Base layers are worn under your gear next to your skin and have the sole purpose of wicking the moisture away from your skin and helping expel heat from your body. These are great to wear at any temperature and on any ride. Cooling vests and neck coolers work a little differently. They basically mimic your body’s cooling system: they retain water and slowly release it to help keep you cool. Cooling vests and neck coolers usually just require that you soak them in cold water for at least a couple of minutes before you put them on. Most are damp but not wet enough to soak you. These do a great job of helping to keep your core cool by aiding in the regulation of your body temperature. Add vented gear to the mix and you’ll actually feel pretty good. This combo will work wonders when you are riding in extreme heat. If you haven’t got any cooling gear, you can probably get by with some cheap tricks. One thing you can do is just soak your t-shirt before you throw it on under your jacket. This will again help cool off your body for a while as the air circulates through your jacket. Another thing you can do is grab a few re-useable freezer packs (or even just ice) and stick them under your gear, in your pockets or wherever else to keep you cool as it melts and takes some body heat with it. Sometimes you just need to keep yourself cool by whatever means necessary. Taking a rest every hour or two is important on days where temperatures aren’t even reaching triple digits to fight fatigue and dehydration, so you can imagine how much more important it is when conditions are extreme. Stopping every half an hour to 45 minutes in extreme heat will help you get yourself hydrated and adjust or hydrate your gear to help keep you cool. Getting out of the heat and resting in an air conditioned room is the most ideal situation, but if that is not available, do your best to take a rest in a shady area out of the sun. Take off what gear you can and just let your body cool down. Don’t rush your rest time. Grab a snack, take a nap, maybe browse a little bit longer in the roadside convenience store you stopped at. If you feel too hot and tired to ride, then don’t. Heat exhaustion and heat stroke set on quick, and you don’t want to push yourself in those kind of temperatures or put yourself at risk. Be smart beforehand and have a route planned out with frequent stops at somewhat regular intervals where you can cool off and grab some water. Schedule your rest time in so that you aren’t rushed to make it to your destination. A little time off the bike making sure your body is up for the ride sure beats a lot of time spent recovering from heat exhaustion or a trip to the hospital from heat stroke. The old adage “better safe than sorry” rings just as true as ever when it comes to taking rests from riding in the heat. If you or anyone in your riding party has any of these symptoms, take it seriously. Get out of the heat and get some fluids in them immediately. Fan them, get some cool water or ice on them and make sure they get their hot gear or clothes off. If symptoms seem to get worse instead of better, get them medical attention as soon as possible, because they might be starting to develop – or be suffering from – heat stroke. Heat stroke occurs when the core body temperature reaches over 105 degrees Fahrenheit. This is very serious and can be fatal. Help them cool down in all the same ways as for heat exhaustion, and get some ice on areas rich with blood vessels such as the armpits, groin, neck and back to try and help cool their blood and reduce body temperature. If there is any way to get them into cool water, try and do it. Taking all the necessary precautions we’ve mentioned above and watching out for your friends can prevent heat exhaustion and heat stroke. Ride Smart and Be Safe! 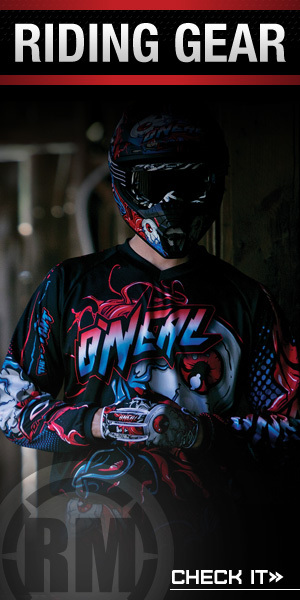 Whether you ride street bikes, dirt bikes, ATVs or UTVs, you can keep yourself safe when you ride in the heat. As we’ve said, as long as you remember to drink plenty of water, cover up with good gear, use cooling gear when you need it and rest often, you can have a good time when you ride in any level of heat this summer. Be smart when you plan your ride and do your best to avoid riding during the hottest times of the day. Earlier in the morning, or late afternoon and early evening will be best if you want to beat the heat. If it isn’t possible not to ride in the peak hours of the day, be sure to rest in air conditioned places or cool shady spots. Be smart, ride safe, keep hydrating, watch out for your friends and get out there and ride!